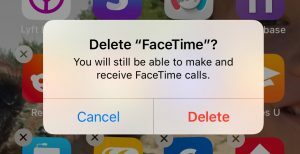 Is your iOS device (iPad or iPhone) stuck on FaceTime call ending? Does it keep saying “FaceTime Ending…” (see the image below). If your device becomes stuck and unresponsive when you attempt to end a FaceTime call, do not worry you are not alone. It seems that a lot of users are having this issue. It further seems that especially iPhone X users are experiencing this problem. This problem is especially frustrating because your device will not respond until the FaceTime call ends. See also: FaceTime Green Screen? Restart your device. You may simply go to Settings > General and then > Shut Down. After that turn your device back on. Update your device to the latest version iOS software. You can do so by going to Settings > General > Software Update. Remove the FaceTime app from your Home Screen and then restore. Here is how:Tap and hold the FaceTime app until it jiggles and then press the (x) icon and then tap Delete. Do not worry, you will still be able to use FaceTime. After deleting, go to the App Store, search FaceTime and download and install it again. Hopefully, one of the tips above will help you resolve your problem. If now and if you are still having problems, you may want to chat with Apple support, or make a genius reservation.